Christ the Tao: Alaskans on Mars! So let me take a first, tentative, if nascently imperial, step beyond our world. How about turning Mars into a summer home for Alaskans? Here is how we would do it. First, develop one of the larger spacecraft considered for "Project Orion," which use nuclear bombs as propulsion. Third, if needed, add a smaller, more salt-rich comet or two. Shake well to mix. Fifth, stock the new oceans with halibut, king crab and the better species of salmon. Then open Mars up as a winter resort for Alaskans who can't book a flight to Hawaii, or in case we have to sell Hawaii to China to pay off our debt. The sun does not shine very brightly on Mars, admittedly. But Alaskans are used to that. And it's sunny every day. We could, perhaps, also import a few seals, polar bears, and other animals that enjoy that sort of weather, once we've got the planetary thermostat down. There's a fair amount of CO2 in the Martian atmosphere already, so that should warm things up. 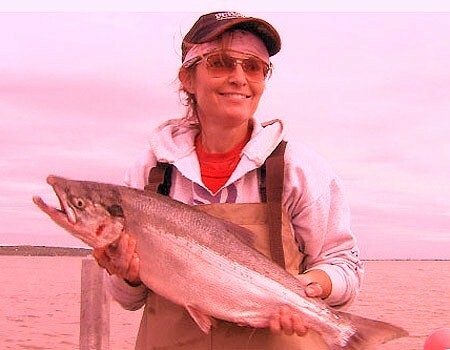 If Sarah Palin buys a summer home on Mars, she can reign as governor, if not goddess of the sea (a position that may not tax her powers of patience for too long.) Then, as Earth increasingly resembles its greenhouse-gas befogged sunward neighbor, the saying will come true, "Republicans are from Mars, Democrats are from Venus." 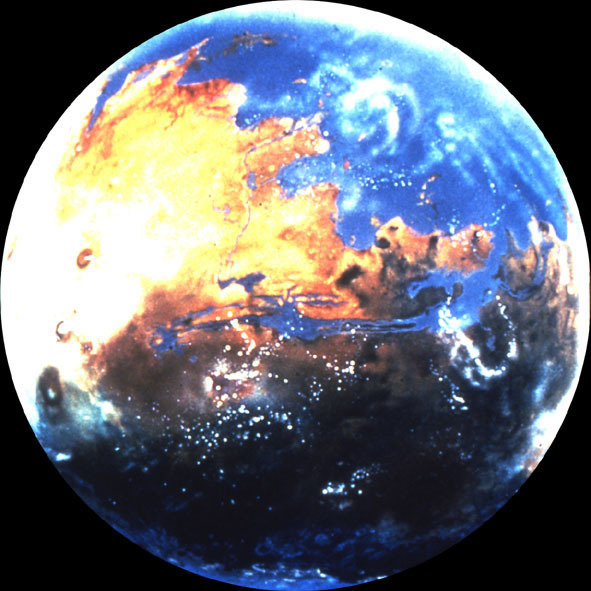 I like the proposal to terraform Mars -- it's been a mainstay of scifi for decades. I'm not sure the Orion Project is the most practical propulsion system to use for this, though; certainly not for moving people. One of the big advantages of this system is the extremely high acceleration available, but that acceleration would flatten humans into toothpaste. You'd have to dampen it by at least 95% just to make the trip survivable (which reduces your thrust advantage drastically), and I'm not sure very many people could survive a 3-4G acceleration all the way to Mars even then. If we had sufficiently developed and reliable automated systems, however, you could possibly use the Orion system to boost them to Mars. Not sure, though, that our present technology is quite up to moving a comet, much less capturing one. One of the big problems, of course, is atmosphere. Even if you could use comets to bring a large amount of water and various gases to Mars, the low atmospheric pressure would cause it to sublimate or boil-off into space quite rapidly. The problem is that the planet just doesn't have enough mass to have much gravity, and without significant gravity you would probably have to hold your atmosphere in with domes, or some other structure. All the CO2 does help heat the planet, but it's still so far from the sun and so small that daily temperature fluctuates more than 100 degrees C in places. And while the rare summer day can reach the high 70s (F), the more usual temperature is 60 or 70 below zero (F), which even your Alaskans used to Fairbanks winters might find a bit nippy. All in all, given present technology I think we have a much better chance of establishing a semi-permanent base on the Moon than on Mars. On the other hand, I am all for sending Sarah Palin to be the Colonial Governer Mars, especially if she takes Michele Bachmann with her as Lieutenant Governor. I was thinking Orion for the water, not for human transport. Add a little atmosphere, and that might stabilize temperatures. I suppose the heat from the collisions might warm things up, too. How fast exactly would the water dissipate? A million years? A thousand years? A century? I'm not entirely opposed to the moon plan. If Palin and Backman go, then to keep them company, it would only be fair to send Obama and Reid as well. Barry and Harry can choose up partners for golf, which Barry seems to think is the point of life anyway: they'll have plenty of holes, and the ball will carry well. It costs millions for his vacations now, anyway, and trillions when he's not on vacation. It might prove a good investment. The big problem is "adding the atmosphere". You can add all you want, but most of it is going to escape into space nearly as fast as you add it, because there's not enough gravity to hold it down. The low gravity and consequently low atmospheric pressure is what will be mainly responsible for your water loss. If the air pressure is low enough ice doesn't even have to melt to dissipate; it will just sublimate, and be lost into space like any other gas. We just don't yet have those handy "gravity generators" that they make so much use of in Star Trek. OK, if you're talking about crashing a Pacific Ocean's worth of H2O onto Mars it will take a while for all that to boil/sublimate off, but even if it lingered for centuries, you would have water, but you still wouldn't have air to breathe. Not to mention that crashing that much mass into the planet might have other, undesirable tectonic side effects. I'm OK with sending the entire government to the moon. But in that case I definitely wouldn't want to use the Orion system. The last thing I'd want them to have is a bunch of nukes and hard radiation to fling back at us in a fit of pique.